"During a campus drive that lasted only one month, 1,500 students and faculty raised $665,000. Every time another 25,000 was pledged, a cannon was fired across campus to cheers of "Boom, boom, stadioom!" The association turned over the November 7, 1922, edition of its magazine, the Minnesota Alumni Weekly, to the students, who produced a special issues calling on alumni to support the stadium ("Alumni of Minnesota, the challenge has been made, the goal has been set, the answer is awaited, you will make good because you are men and women of Minnesota, children of a state which never fails"). 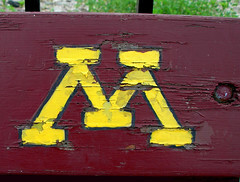 Brochures (What Does the University Mean to Minneapolis?) and a song ("Dig Down, Gophers") were written. The association, working with the American Legion, led an alumni campaign in every county and state and every state in the union, hoping to personally contact each of the University's 38,000 alumni. Alumni staged University Day in Minneapolis, and 5,000 undergraduates marched up Hennepin Avenue. An additional $1 million was raised, with 7,025 pledges coming in from all over the country and as far away as Japan. Every cent went to the building fund; the alumni committee underwrote all campaign expenses. By September a site for the stadium (at Oak and University) and a design (U-shaped instead of a bowl) had been chosen. A team of four faculty members headed by Frederick Mann from the University's Department of Architecture designed the stadium in collaboration with Osborne Engineering of Cleveland, Ohio. A ground-breaking event was held March 6, 1924, a cornerstone laying ceremony on June 17. By July 1924, 475 workers were on the site ten hours a day, six days a week. The Minneapolis-based James Leck Company built the stadium in seven months&emdashabout 40 days ahead of schedule&emdashat a cost of $572,000. (The remaining funds raised in the campaign went toward the construction of Northrop Auditorium in 1929.) The stadium covered approximately eleven acres. On October 2, 1924, the first official event, a freshman convocation, was held in the stadium. On October 4, the Gophers won the first foot-ball game ever played in Memorial, beating North Dakota 14-0. Tickets were $1.50. 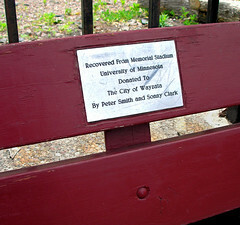 In 1992 the Memorial Stadium was torn down under Nils Haselmo's term as University of Minnesota President. "The University’s current plan for a new $235 million campus stadium has the University raising 60 percent—in large part through private funds—and the state kicking in the remaining 40 percent of the cost." To our surprise a wave of heat sent these irises up and blooming. I am watering them - now! Sunday was a humid, sweltering day, and I knew it would be very early. I rode my trusty Trek bicycle around the lower lake at 6:30 am to make sure to get a training ride in before the heat set in. Riding west out of Excelsior you take a turn north along a county highway (I do not know the number) - and you travel over a narrow isthmus. The many varied bays lay to your left and right - Gideons Bay, Carmens Bay, Crystal Bay, Lafayette Bay, Echo Bay and others stretch to your left and right. It was very early, quiet, and traffic was light.The air was warm. As you circle along the north side of the lake you travel through small townships, - cities like Orono, Minnetrista, Navarre and Mound. It is not hard to sense the spiritual attraction this area held with the ancient native americans called "The mound builders". The mystical quality of the lake is overpowering. 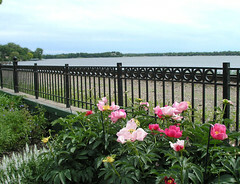 Long expanses of water with tree covered islands dot the horizon. The mound builders built many low rising mounds for burial and ceremonial purposes here. 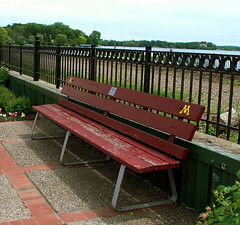 Across the northern side of Lake Minnetonka many more mounds were built - and thus the city of Mound received its name. The Chippewa and the Lakota/Dakota built seasonal villages here. The many sided lake holds its power. I rode 20 miles in about 70 minutes - there was very little wind. 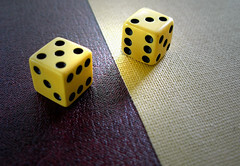 Sometimes it is just a roll of the dice. Yesterday, our second dog - Bichon "Maxi'passed away from a veteranary prescribed medication. He was 12 years old. He had incurred a severe back injury... chasing some wild animal through our woods. We took him to our clinic. The vet prescribed a muscle relaxant mediacation that was too strong for the little guy, and he passed away. 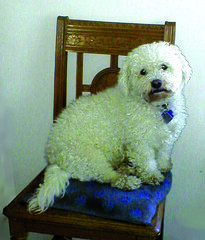 Maxi's history was a sordid tale, but for the last 10 years he was a very happy boy, and a very good friend. He is gone and we miss him. I burried him in our woods. We have only one dog now. Indulge me if I post a few photos of the "Rock". Mixed breed- Shelty Corgie. Donkey Park - the name is carried on. A small park is located directly across the street from my house, and is surrounded by 8 or 10 homes. We have called it "Donkey Park" for the 15 years I have lived here, and it has probably held it informally for a long time. Unfortunately this may be historically incorrect. Just about 1/2 block down the street is a more elaborate park.- It has playground equipement, bronze sculpture and a gazebo. It is called "Children's Park". "Cottagewood Children's Park is remembered by some as the place where the Hazeltine sisters grazed their donkeys, until 1918 when they were banned from the park by the City Council. On June 10, 1918, the matter of Cottagewood's "Donkey Park" in front of Hazeltine's was discussed at the Council meeting. Although it was too late to plant flowers, Charles Saline was appointed to cut grass and allowed no animals to be tied there." So, it seems our little park...more of a public space, can claim the abandoned name'Donkey Park" even if it is innacurate. I might note, however, that we do not really know how far the Hazeltine Sisters grazed their donkeys, or the old boundaries of the park. - There will be a neighborhood Barbeque on Monday at 4:00. The weather is cloudy. 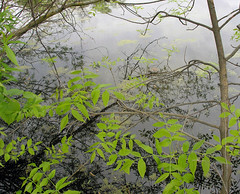 Reflections of leaves onthe water. Da Vinci's Annunciation - secrets unheard! On the eve of the opening of the "Da Vinci Code" movie I have discovered other Leonardo secrets! In "The Annunciation" Leonardo depicted a hearing impaired "BVM", the Annunciation seems to have been delivered to Mary in American Sign! Note: This is merely my way of saying - be very careful how you interpret realistic works of the past... & Hello! to all my hearing impaired friends! I have just read an article in a local paper about an Electronic Monitoring in Gray’s Bay. The surprising thing about this article is that it never tells you anything about what this monitoring system monitors. It mentions that the system is funded with a “grant”, but it does not say who the grant is from. - Important information for the reader. I am always surprised at what is omitted in news articles. This is often much more important than what is included. However in this case I will blame the editor. Who, what, where, why and how - basics. 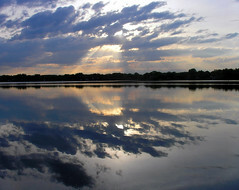 The article states that the Lake Minnetonka Conservation District insisted upon “indemnificationfrom legal action” upon installation of the system. Motivated, no doubt, by the legal problems incurred by the cameras on Minneapolis City semifors. At least the LMCD is thinking ahead. - Still the article does not tell us what the system of cameras will monitor, or for what purpose. I will venture a guess, since I am given little information from this FRONT PAGE ARTICLE. Lake Minnetonka Conservation District wants to monitor the boat traffic on Grays Bay - probably for milfoil on boats entering and exiting the bay. I can only guess. The attached commentor is correct. 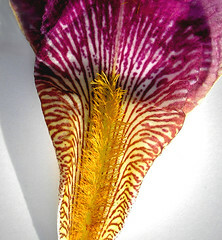 In the sixth paragraph of the article on the purpose of the monitoring system for Gray's Bay, exotic species such as Zebra Mussles are noted. My apologies. Querry: Who is the grant from? - & Thanks to the commentor for reading my blog. A brief announcement about the upcoming MS 150 - a ride from Duluth to the Twin Cities June 9-10-11. I belong to a team called "Stevie's Wonders" and I have decided to drag my bones over this course once again. This will be my 4th time. Our team captain Lisa G. has done a remarkble job organizing this 90 plus member team, making this event a very fun and rewarding one for everyone. 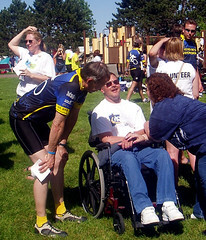 Lisa's brother suffers from MS. You do not have to search far to find Steve, he shows up and loves the event. You see the results of your efforts. If anyone asks you for an MS pledge, please contribute. I will be featuring photos of the event daily on my blog and FlickR... so this is your fair warning. It is a bit of a side venture, but it will allow me to show you "people photos". During my last MS 150 ride I told my contributors I would take an MPG movie of myself at my last stop before heading in. I was so ragged tired and out of it that I bauked. I wasn't sure I would make it. I was suffering from my lifelong nemesis- heat exhoustion. But my vitals were ok, I was not dehydrated, and my jokes had not improved measurably - so I finished the last 17 mile stretch whimpering, with a vow never to do this again if I wasn't in top shape. So much for that promise! 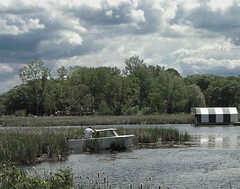 Tree thinning and removal near a wetland. The 16th century French word "buie" and its cooresponding German word from the same time frame "baukn" are attributed with being the origin of the contemporary word 'buoy'. Both words mean "beacon". A counter point, just to confuse me, is that there is also a French word circa 1645 - "boie" which means "chained to one spot" or teathered. Needless to say, somewhere in 17th century Europe the term had its roots. 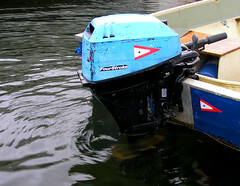 "Buoys and markers are the “traffic signals” that guide vessel operators safely along some waterways. They also identify dangerous or controlled areas and give directions and information. As a recreational vessel operator, you will need to know the lateral navigation markers and non-lateral markers of the U.S. Aids to Navigation System." 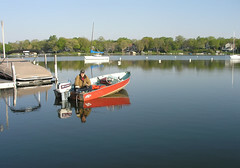 Current high water conditions make 'No wake zones' markers particularily important. So there you have it. Fishing opener is upon us and the markers are out. The weather is so cold and rainy that I doubt the fishermen will find much competition with waver runners and recreational boaters on a tear. Good luck... brrrrrr. As I rode my bicycle on the Luce Line Trail and neighboring areas on Sunday I noted high water and flooded roads and farms. It has rained since, heavily, with more rain forcast today and throughout the week. 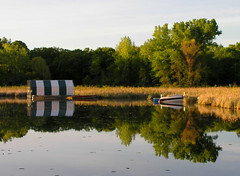 DEEPHAVEN, MN May 3, 2006. 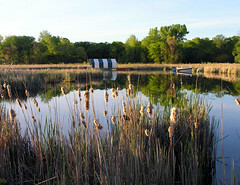 The Minnehaha Creek Watershed District is alerting the public of high water conditions near Minnehaha Creek and Lake Minnetonka. Owners of flood-prone properties and low-lying yards should be prepared for high water and possible flooding. The district advises against recreational use of the creek; current flow rates are extremely dangerous and will increase between rainfalls. 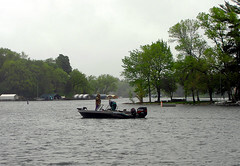 On May 1, Lake Minnetonka reached 930.17 feet, topping the weir north of Gray’s Bay dam. This condition causes uncontrolled flow over the weir into Minnehaha Creek. Water levels are expected to continue rising from rainfall and runoff, and will continue for the foreseeable future, due to ground saturation and seasonal rains. 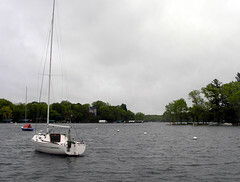 Lakes draining into Lake Minnetonka are experiencing high water levels, further increasing flow into the Lake and Minnehaha Creek. As I passed Carson's Bay, on the way home from purchasing a sunday paper, I thought I would take a photo of this serene setting. 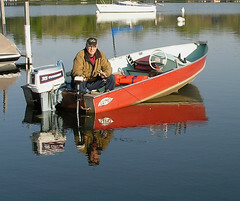 A lone fisherman, his name was John, graciously allowed me to take his photo. 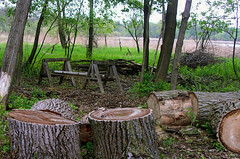 Hunting the willey morel- Minnetonka. “When the leaves of the oak are just the size of a mushroom, that is the time to hunt for morel”. This sage advice was offered to me by an old neighbor about morel hunting. The season is upon us, but a blast of heat would help. WHERE TO FIND THEM: Black morels grow in the same kinds of places their later arriving kin, the white/gray and yellow morels grow, they just pop up first. The very best places to look for all these species are areas where there are live or dead elm trees. 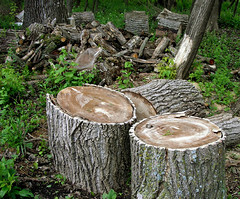 Even areas that once held elm trees or where there are a few rotting stumps are good spots to look. This is true even in suburban yards. Many city dwellers walk into their yards on an April morning and find morels standing like small spikes in their lawns. In the past in this blog I have misspelled the name adding an extra “r” to the name. Apologies. 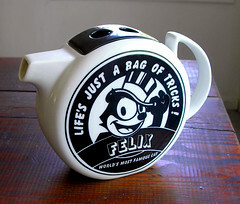 I also stated that my search only turned up a vintage pop bottle. Later I found a few, but my search was too late, they had past their prime. but the discovery did offer hope. Friday fun facts. 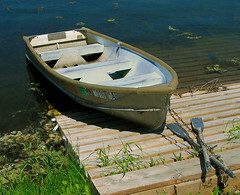 Yes in a land of over 11,000 lakes there are four unlucky counties, in respect to lakes. In respect to the number of counties, Minnesota has 62 counties. I have often wondered how we have arrive at this number of counties, but that is a whole other can of worms. And to continue with other lake trivia, here are some deep discoveries. 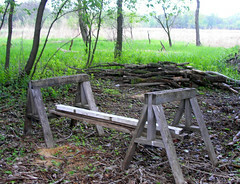 On my evening walks with my dogs for years I have noticed a strange old brick structure in Cottagewood. Shaped like a cylinder, I wondered what it was. 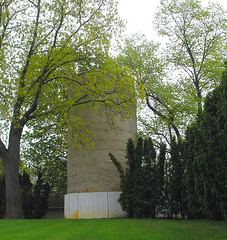 Having lived in St. Paul’s Highland Park I assumed it was a water tower like the Highland Water Tower (the highest point in the Twin Cities). Upon my reading, my assumption proved correct. The origin of the tower is unknown, but most think it was a private water sourse for the Keewaydin Hotel built in 1892-1924, when the hotel burned down. The tower was modified in 1911 by Arthur Dyer, a local shipbuilder of some reputation. It provided water to Cottagewood untill 1941 when it was abandoned after attempts to sell it failed. Still, there it stands... I wonder what is inside? Sitting in the middle of Lake Minnetonka... well not quite the middle, is "Big Island". Wouldn't it be fun to have the old amusement park back? Some of the parts are still in use at Valley Fair. Big Island was once one of the prime draws for tourism (1890s). Or perhaps they could build one of the stadiums there! Just a little whimsey. Actually the logistics would be preposterous. ..and the noise would drive me crazy.